If it’s a new home you can be sure the property will need plenty of new landscaping. If you purchase an existing house, most new owners want to change the landscape to reflect their style, family needs, likes and dislikes. Generally none of this work is minor so it should be given careful consideration because you will be living with it for a long time. In both of these cases we always recommend a design on paper. Sometimes clients ask why don’t we just forgo the design on paper and use the design money to pay for some of the actual landscaping. 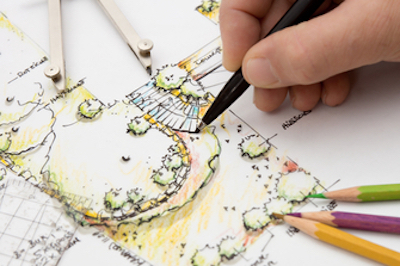 Here are some of the reasons a landscape design is not a waste of money or a waste of time. Most homeowners don’t have unlimited budgets so they don’t complete all their landscaping from start to finish…they phase it out over a period of time as their budgets allow. That being the case you want to make sure that when you finally do finish the final product has a sense of design, continuity, and reflects your style. If you do the work without a roadmap or design, people tend to add some of this and add some of that, one thing they like at their neighbors, something else at their mothers house, something they saw at an office party…before you know it their entire property is a big hodge podge of chaos without any sense of continuity, style or design. Some homeowners like to get quotes from various contractors or specialty trades and the only way you as the homeowner can compare quotes on an apples to apples basis is to insure that every contractor is quoting you the same thing, the same plans, the same specifications. You don’t want contractors all proposing something different leaving you to decide which idea you like the best and which price is best. Plans and Designs give you a historical record so if something gets damaged you can find and figure out things later, buried pipes, buried wires, “what was the name of that plant that died out by the back fence,” “what kind of stone did we use on that rock wall,” “where did we buy those lights in the trees?” With your design and construction plans alll those questions get answered many years after the work was completed. There are two types of design; A “Biddable Plan” or full set of drawings with details and specifications and it is generally submitted to government agencies, h.o.a.’s, various contractors. 2). There is a “Design Build Plan” which is generally less expensive because it lacks some detail and it is generally used while negotiating with a specific contractor…this plan is generally a drawing that provides a roadmap for the contractor and it helps the owners visualize what, where and how things will look when completed.